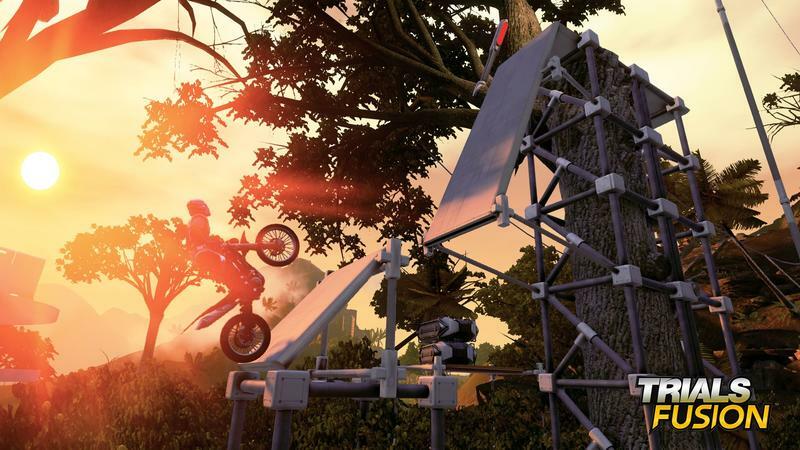 Trials Fusion is a great game held back at every turn by its own aesthetics and the technology that powers it. The deep game we know and love is there, but to find it requires disabling options and overlooking some glaring issues. 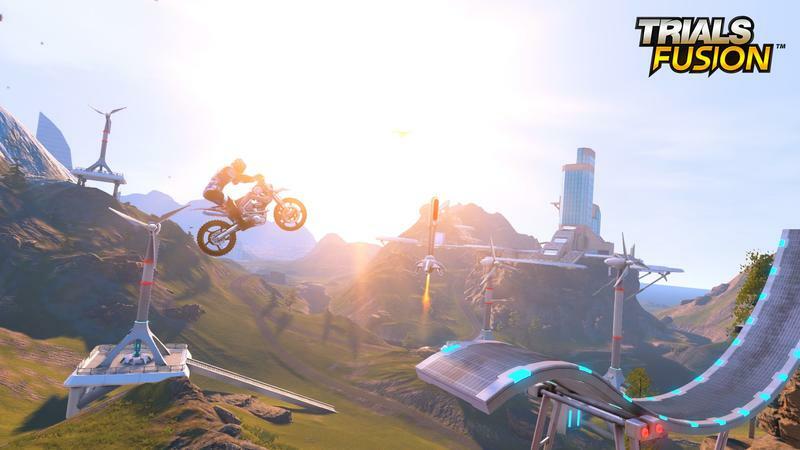 Trials Fusion is set in the future. We know this because the intentionally cheesy opening theme song's lyrics are "Welcome to the Future! Man, Machine, The Future!" Via the equally cheesy announcers that accompany each track, you find out throughout the game that the riders are clones, that the world is full of mutant animals, and that the environment is going crazy. The announcers, which are GlaDOS-style AI constructs, disintegrate and argue with each other over the course of the game. The problem with this narrative is that none of it works, plain and simple. It's trying hard to be funny, but most of the jokes miss wildly. It feels like the writer was a fan of Portal and wanted to do the same thing. Except they missed the point, and none of the jokes hit the mark. Even worse, Fusion is a game where the best players will be constantly restarting, making announcers annoying and repetitive at best. Before long, I ended up turning off the announcers completely. Levels often have audio cues that trigger at checkpoints as well, making turning off the sound effects altogether seem appealing at times. In an early level for example, a siren blares at the first checkpoint. It's not normally a problem, but if you're trying to get a perfect run or accomplish one of the side missions, it goes from cute to grating at the drop of a hat. The problems don't stop with the audio design, either. The game also suffers – across all platforms – from painfully obvious texture pop-in. On the Xbox One version, there's some noticeable screen tearing as well. Loading times are long as well, though this becomes less of an issue as you get to more difficult tracks and try to improve your scores on earlier ones, rather than just racing through to get medals quickly. Somehow, all of that doesn't spoil what really makes Trials work: the actual meat of the game. If you've played Trials before, this isn't going to wrinkle your brain or anything. It's simply more of the game we love, meticulously designed and tightened up. Nearly every track is a pleasure to play, whether it's for the first time or the 100th reset. Obstacles are well placed and tuned, and the times set for achieving each new medal are set perfectly to ensure that it's easy to get close to the necessary time, but substantially tougher to shave off that extra half second to actually get that medal. One thing Fusion gets especially right is the way levels slowly educate players on the different skills required to complete them. There are formal training levels in Fusion, which do a good job of introducing concepts like the Bunny Hop, but the levels themselves do a great job training these skills. This might sound backward, but later levels will prepare you for earlier levels. Levels that previously had seemed barely passable at a copper medal level start to look manageable and even easy when you go back to them later. What previously took half an hour and a hundred retries now takes a few attempts and a couple minutes. Those levels that do require all the retries you have available, though, are still fun, even when they feel unpassable. You can feel that you're just one more retry away from nailing the jump, and the feeling when you do finally get it is absolutely triumphant. Until you hit the next snag. It's a rhythm that few games seem to have as good a handle on as Trials does. The one really glaring weakness to Fusion's single player is the addition of a tricks system. By moving the right analog stick during jumps, you can pull off tricks like standing on the bike midair or flipping it upside down and hanging off it. The system is finicky at its best moments. It's possible to pass the trick stages, but the fun of retrying and overcoming obstacles is absent and, unlike the tight, sharp physics-based controls of the main game, the tricks stages feel loose and unfinished. There are only a few trick stages, and it feels like something that could've been left on the cutting room floor. It's important to mention that the multiplayer mode that Trials Fusion ships with is purely local. Local is probably the best way to play, but the online multiplayer that was promised isn't coming to the game for some months yet. It doesn't hurt the single player, but its absence makes the higher price tag on the game sting that much more. 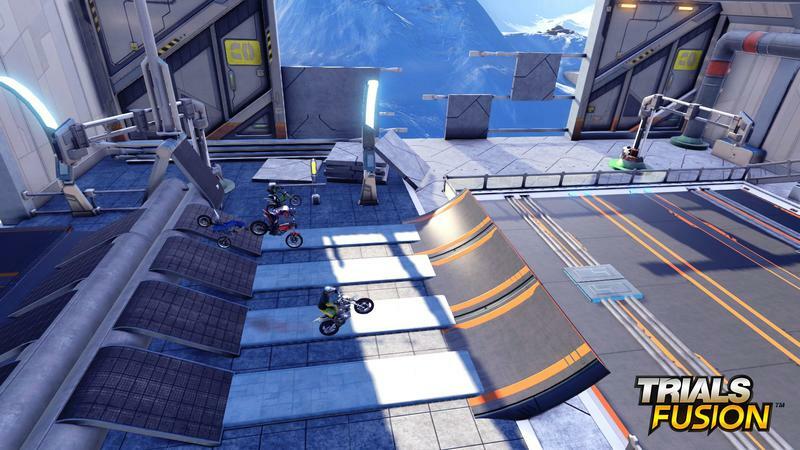 Even with the price tag and without the multiplayer, though, Trials Fusion is worth the price. There's more fun and replayability to be had in any Trials game, Fusion included, than in much more expensive games. Turn off the announcers, rev your engines, and get hopping. 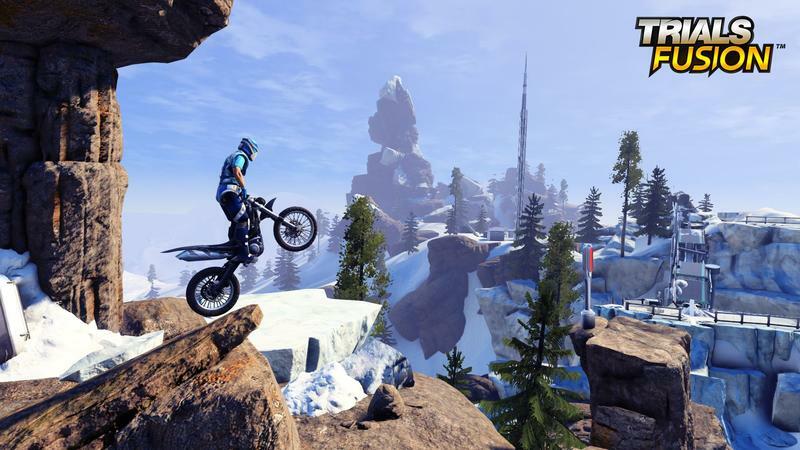 We purchased Trials Fusion for Xbox One with company funds. We completed the single player mode and experimented with track building and local multiplayer modes before starting this review.